I’m so excited. I’m going on a writing retreat! 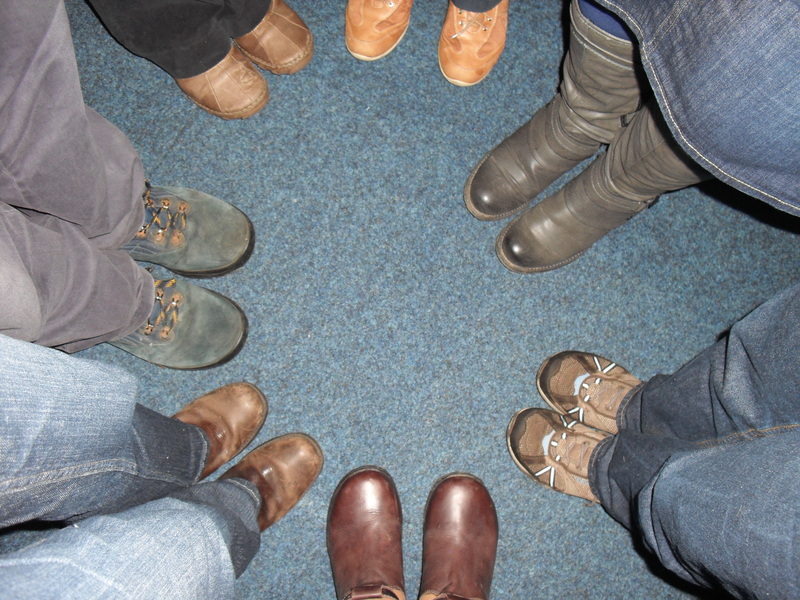 This weekend, my writers group is convening at a nearby conference centre for a weekend of writing and eating and talking about writing and eating some more, and maybe a little bit of dozing or walking, and then some more writing. We normally do this once a year, but this year, we enjoyed ourselves so much we thought we’d do it again at the end of the year. So here I am, thinking about a weekend spent solely with my friends and the Work. This year I am thinking about the goals or intentions I have set myself for this website, for my publications, and for moving my writing on to the next level. Its one of the few truly extended, uninterrupted periods I get to just write, so I like to choose a project that I can get my teeth into, but also one that really needs to be tackled. Something pressing. This year, I am toying with the idea of doing NaNoWriMo, because I want to crank out a novel as fast as possible. So I have decided to lay the groundwork on this new idea, and throw myself into it, immerse myself in it as much as I can. In previous years, I have redrafted novels or short stories, polished specific sections of a novel, worked specifically on character, or redrawn a dodgey plot. My goal this year is especially fuelled with the knowledge that I need to be writing something original, something other than fanfiction. Nothing wrong with fanfiction. Its given me marvellous confidence in my work, and I love writing it. I just think I need push myself, to do something new. I’m not going to finish an entire novel in a weekend. I may even get no further than writing 500 words. And I am okay with that. When I first started going on retreats, I had HUGE expectations of myself and what I could achieve. I thought I could crank out 20,000 words in two days, a third of a novel. I thought I could create publisher-ready prose. The truth is that even on retreat, there is only a limited amount of time, and making really good prose takes time. A lot of time. I have only learnt this with experience. There have been several retreats where I have slept badly on the first night, or felt ill, and as a result have really been unable to do anything much at all apart from eat, sleep, talk with my fellow writers, and be. Sometimes that is what a retreat is for. I have gained from those experiences. These days I am ready to allow my retreat to be whatever it needs to be, and to trust that whatever happens is part of the process. So I make plans, but I don’t get too attached to them. Being aware of my physical wellbeing is very important on retreat, and not simply because I suffer from chronic illness. I need to be present in my body, so I do yoga and meditate, go for walks, stand in the shower and feel the water on my skin, and take naps. (One friend uses the annual retreat to undulge in long, hot, scented baths because she doesn’t have a tub at home!) This might all seem time away from writing, but it is crucial. Self care is part of retreating. Doing these things allows me time to think about the writing, to form scenes and sentences in my head. But it also allows me to come to the laptop refreshed afterwards. So it is an investment in my writing, as well as my body. As a result, packing right is really important. I always make sure I take warm, snuggly clothes, my yoga mat and yoga clothes, a hot water bottle, walking boots and, on occasion, even a teddy bear for cuddling purposes. And because I have weird dietary issues, I make sure I take an extra supply of good, healthy foods and my favourite herbal teas too. The centre staff are really great in catering for my diet, but there are those in-between-meals moments, when what you really need to fuel the Muse is your own favourite brand of chocolate! I get very anxious when I am away from home. I need to be grounded in my safe environment in order for my imagination to work properly. It helps that we have been going on retreat to the same place for years, and also that it really isn’t very far from my own home, so I feel like I am on home turf. Other people find their imagination is stimulated by unfamiliar territory. Mine just shuts down so that my emotional system can cope with the panic attacks. To counter this, I take music and listen to it doggedly in order to transport me to safe psychic territory. I put on my headphones, close my eyes and fly away. And then I can write. It is a major diffence to how I normally write, which is in silence. So part of my preparation ritual is to gather music around me. I make playlists for different characters, delve into iTunes and my CD collection, choose music that evokes particular memories or landscapes for me, or none at all. Going on retreat is supposed to be calming, an activity to feed your soul. Its supposed to be downtime from your usual life. As a result it is easy to get really wound up about how good it is going to be, and then find yourself disappointed. To feel like you just aren’t calm enough, or getting enough done, or maybe even that you are wasting time that should be spent looking after the kids, doing the washing or writing that sales report. This harks back to managing expectations. But it also has a deeper meaning. You aren’t being selfish. Leave all your SHOULDS and OUGHTS at home. You deserve to have this time spent solely with yourself, doing something you love. I continue to struggle with this. I tend to make retreat a time which is about productivity rather than identity – about being myself and giving myself what I need. When you accept retreat as a gift to yourself, managing expectations becomes easier. And that precious dimension of writing that no one seems to talk about – moodling – becomes possible. Have a weekend’s moodle. Because you are worth it. 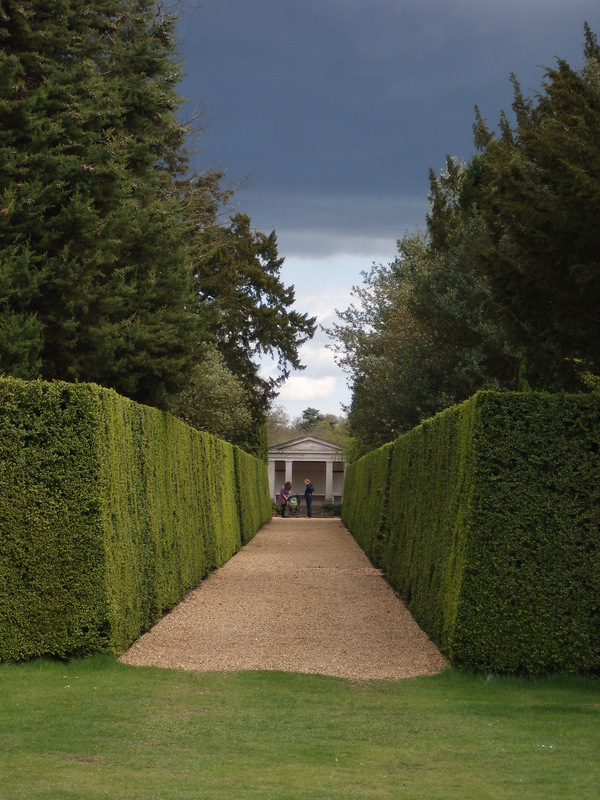 I heartily recommend going on a retreat if you can manage it. Maybe for a day, or even overnight. Maybe just for an afternoon. If you are looking for ideas and guidance, I also recommend Judy Reeves’ wonderful ‘A Writers Retreat Kit: A Guide for Creative Exploration and Personal Expression’, which I ordered recently from Amazon in preparation for this weekend. Now I had better get back to my packing! This entry was posted in Creativity, Finding your Creative Tribe, Freedom to be yourself, ideas, Inspiration, Moodling, Music, Notebook, Notebooking, Nurture Yourself, On Process, Safe Space to create, Self care, SHOULDS, The Creative Process, Writers Groups, Writing, Writing Retreats and tagged Moodling, National Novel Writing Month, preparing for a writers retreat, self care, Writers Resources, writers retreat, Writing on 16.10.13 by evenlode1967. 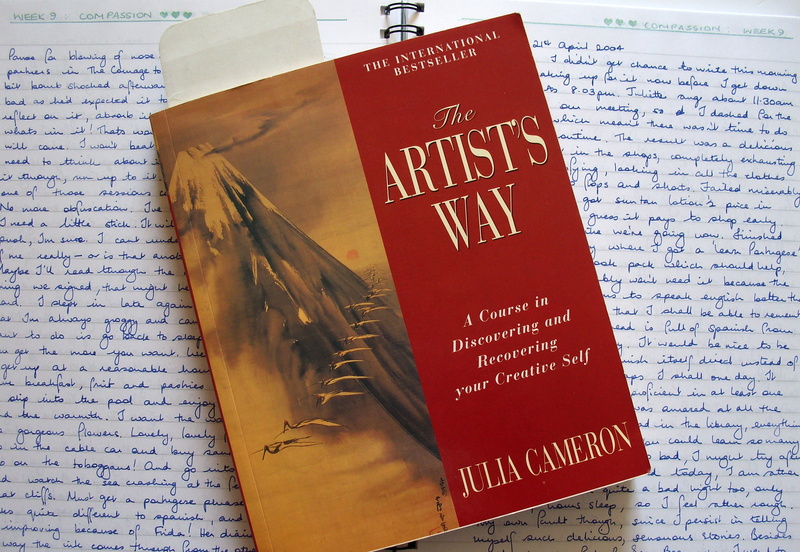 If you read creative blogs of any kind, you are bound to come across Julia Cameron’s ‘The Artist’s Way’ eventually. It’s cover bills it as ‘A Course in Discovering and Recovering your Creative Self’, and yes, it does exactly what it says on the tin. I first completed the whole 12 week course in 2004, and now I am about to embark on a refresher. I’ve pulled my much loved, somewhat dog-eared copy off the shelf and on Monday 6th May 2013 I shall launch into the unknown once more. Cameron proposes two tools for this course, Morning Pages and Artist Dates. No doubt we will talk about Artist Dates at some point soon, but today, let us think about morning pages, because they are enormously beneficial, whether you are a creative or not. Basically, what we are talking about here is three pages of brain dump. You write them by hand because it enables your subconscious to express itself. You don’t judge them, you don’t ty to be neat, you don’t reread them. Cameron suggests doing them on loose sheets of A4/letter size paper, but I prefer to keep them in a notebook, the same kind I use for my writing notebook. Whatever comes out. Three pages every day, no matter what. Three pages to ground yourself in the very core of your psyche, to drain out the poison and find the shimmering gold doubloons resting on the sea bed beneath. I have kept morning pages on and off for 9 years. I have never reread any of them. But when I do them, I find myself making sense of the world and my feelings, finding a way to my dreams and interests, naming new ideas and enthusiasms, letting out the bile that is getting in the way of health and healing. I profoundly believe in the healing power of these pages in draining the poison and pain from life. I have recommended it to several friends and acquaintences who were struggling with clinical depression. They have found them enormously beneficial, as do I. I now recommend them to you, not because I think you need help, but because they will help you find yourself, because they will help you become more of who you really are under all the OUGHTS and SHOULDS. Set your alarm half an hour earlier this week. Get yourself a decent large notebook and a pen you like to write with (I do mine with a lovely old Parker fountain pen). Write your three pages every day. Do not judge yourself. Do not censor yourself. Get the dross and the sparkles alike down on paper. If you would like to join me on the Artists Way, you are more than welcome. I shall be writing more about my progress on this blog, and I would love to hear from you in the comments if you are game. This entry was posted in Inspiration, Journal exercises, Journal Friday, Julia Cameron, Morning Pages, Outwitting Nigel, The Artist's Way, The Habit of Art and tagged Artists Way, Creativity, Julia Cameron, Writers Resources, Writing, writing exercises on 03.05.13 by evenlode1967. And so he goes on. I asked him at a signing once about how he dealt with getting stuck in the middle of a novel, and he obviously interpreted it as me asking The Question, and didn’t take it well! Maybe we don’t know where the ideas come from, but how do we get our minds into the right place for them to arrive? Its about putting lots of mulch in the ground to make it a rich, fertile place for new things to grow. I have an assortment of answers to this problem, but today I thought I would share one of them with you. I make a playlist for every novel I write. When I am sitting down to work on a scene, or with the characters, I play the playlist on my headphones, and this gets me in the mood, gets me in touch with the characters, the environment, the colours and sounds through which they move. Often, particular characters end up being associated with specific tracks. And sometimes, it is just one piece of music that I hear that sparks a story, or gets me in the mood to write. Get out your CD collection, or your iPod, or fire up youtube, however you listen to music. Listen to a few tracks and see what mental images are conjured up. What landscape can you see? What kind of people inhabit this world? Can you see their faces? What challenges are they facing? Who do they love? Who do they hate? Get out your writing notebook and begin to set down what you can of these images. You may need to make lists of ideas or words, or you might like to write passages of description. You might even draw! Note everything that comes to you, and listen again, as many times as you need to in order to get out as much as you can. Don’t forget to write down the piece of music and the artist whose work generated the images you have found. This exercise may prompt a whole new story, or you could use your descriptions to feed into something you are already working on, or something you have yet to write. Nothing you write is ever wasted – it can all be recycled into new work. Happy listening – and writing! This entry was posted in Inspiration, Learning the Craft, Music, Notebook, Notebooking, Writing, Writing Exercises and tagged creative writing, Iain Banks, music for writing, notebooking, Raw Spirit, Richard Hawley, Writers Resources, Writing, writing exercises on 29.04.13 by evenlode1967.